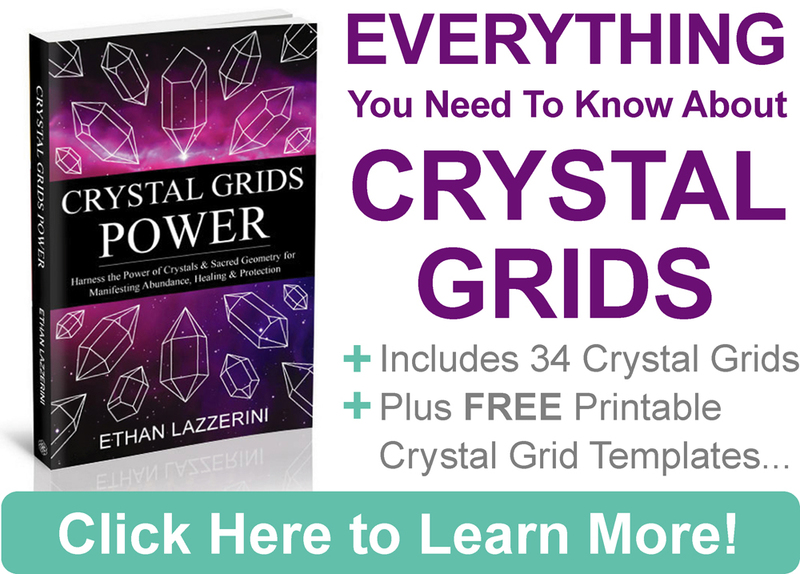 Learn how to program crystals easily and discover why you would do this. Do you really need to program a crystal? 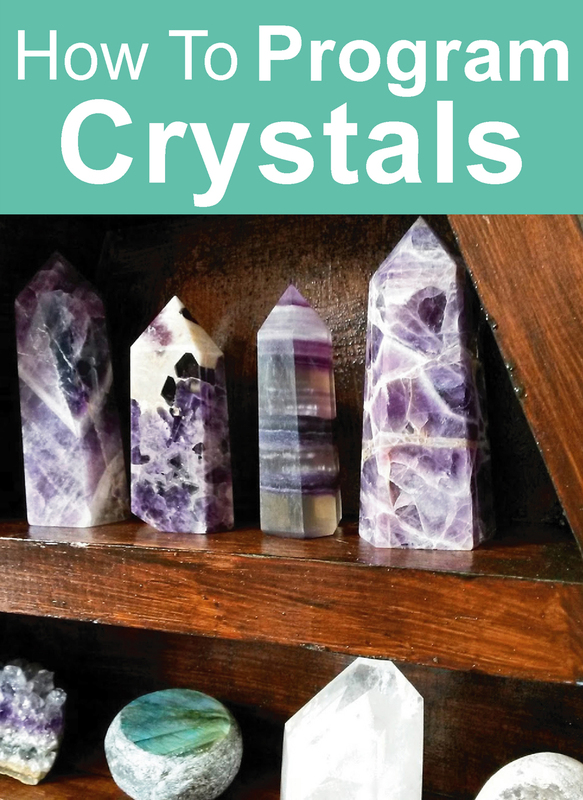 Learn how to set a crystal clear intention for a crystal in my simple crystal healing guide for beginners. It sounds like you will need some tech skills but it’s actually pretty simple. Programming a crystal is basically working with a crystal for a very specific purpose. It is a way of communicating with the crystal what it is you need it most for, so it can help you towards your need or desire. Most crystals have a special crystalline structure which is believed to hold energies, thoughts and information. Interestingly these metaphysical concepts are similar to how silicon (which is what crystals like Quartz are made of) is used in computer chips. See your crystals as sensitive tools which hold and transmit energies. Why Would I Program Crystals? Crystals do not have to be programmed to work but many people find it helpful for certain purposes. When you program a crystal you are setting a crystal clear intention for what you need help with. 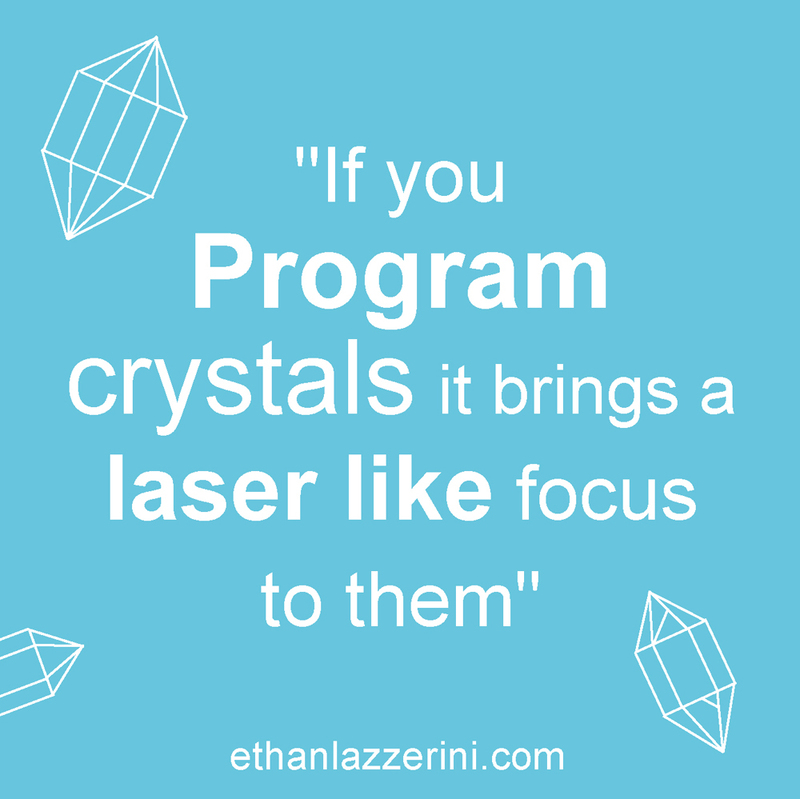 Programming gives your crystal a laser like focus. It will do what it can to help you and however it can. This is ideal for when there is something very specific you chose a crystal for. This could be a crystal you wish to carry with you for a time period, crystal healing jewellery or when creating a Crystal Grid. These are all long-term goals. There is no need to program all your crystals or to program a crystal for a day for example. If you want to benefit from the general properties of a stone or if you chose it intuitively, there is also no need to program it. Your intention should follow the natural properties of the crystal. You are harnessing the energies, not adding anything that isn’t there. Some crystals such as Quartz are multipurpose and can be programmed for anything. 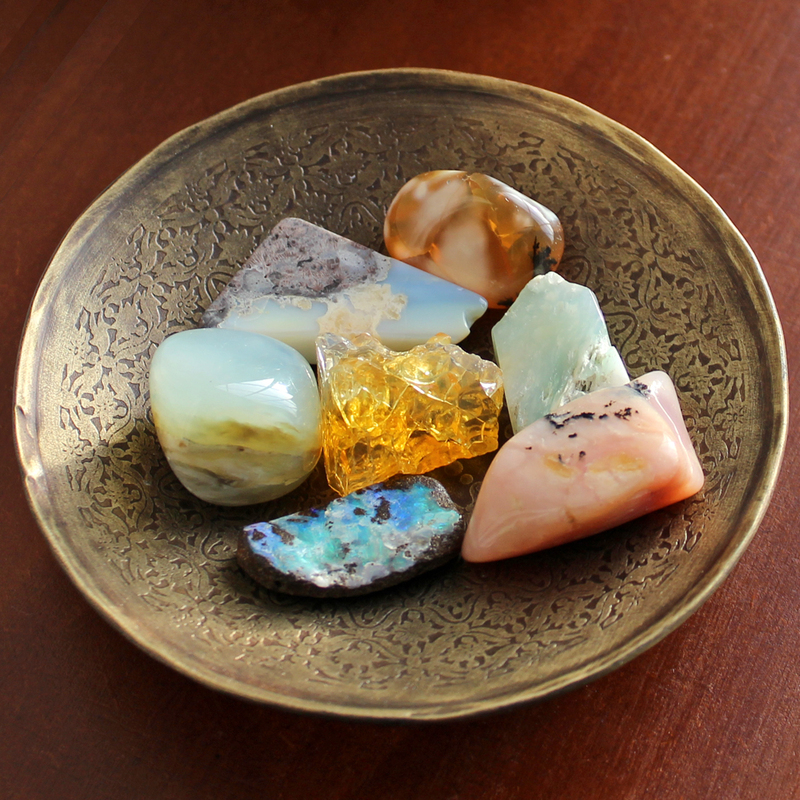 You may have the intention to program a crystal for healing, protection or attracting abundance for example. But Won’t The Crystal Already Know What I need it for? Programming crystals is a personal choice. If you don’t want to do it, don’t do it. The way I look at it is, crystals have many different properties. Crystals work in their own ways but crystals are more than happy to help you if you communicate that to them. I don’t see it as telling the crystal what to do or that it will limit its effect in some way. When we program a crystal, we are being clear about what we most want help with. We do not tell the crystal ‘how’ to do it. I think there are a few misconceptions out there about programming and I feel some people, especially those new to crystals can have a knee-jerk reaction to the word ‘program’. I use this word at the moment as that is the most well-known word for this. It could be called charging the crystal with my intention, communicating my intention or empowering it for a purpose. I do not see this as any different from placing a Rose Quartz crystal on your Heart Chakra. People that work with crystals choose different crystals for different reasons all the time. If you have ever used a Crystal Wand in energy healing, you used the crystal for a specific reason and channeled the energy in a very specific way. If you go to see a good Energy Healer or a Crystal Healer they will ask you to tell them what you’re having problems with or what results you wish to gain from their expertise. The healer can then work with you as well as tune in and see what needs to be done. You are not telling them how to do their job and I bet you will get better results than not speaking to them. How is this any different? I feel programming is how a Crystal Grid works and I do not see anything wrong with that. Our programmed intention, guides the crystals and they help us however they can. In many spiritual, shamanic and metaphysical traditions people ‘charge’ or ’empower’ their spiritual tools and items with their intentions. This includes herbs, oils and incense. They understand these are from the earth and consider this working with these natural items and their energies. These are ancient practices. Crystals are also a part of these traditions and I wish people would be a little more respectful that there are different paths and ways for working with crystals. You can work passively with crystals if you wish. When I started to program/charge/empower certain crystals with my intentions, it not only made them more effective for me, it also helped connect me consciously with the stone. I do not feel this limited those crystals in any way. I have known many people who were not seeing the results from their crystals until they started to program them. It can be a great way to build a relationship with your crystals. Unlike those that may tell you not to program crystals, I do not tell people that they have to do things my way… If you have read my books you will know that I offer alternative ways to communicate your intention and request for help from the crystal. I have added these alternative wordings to the programming method below to keep everything in line with my latest books. Choose the wording that works best for you or create your own. How To Program Crystals . Save this to Pinterest! 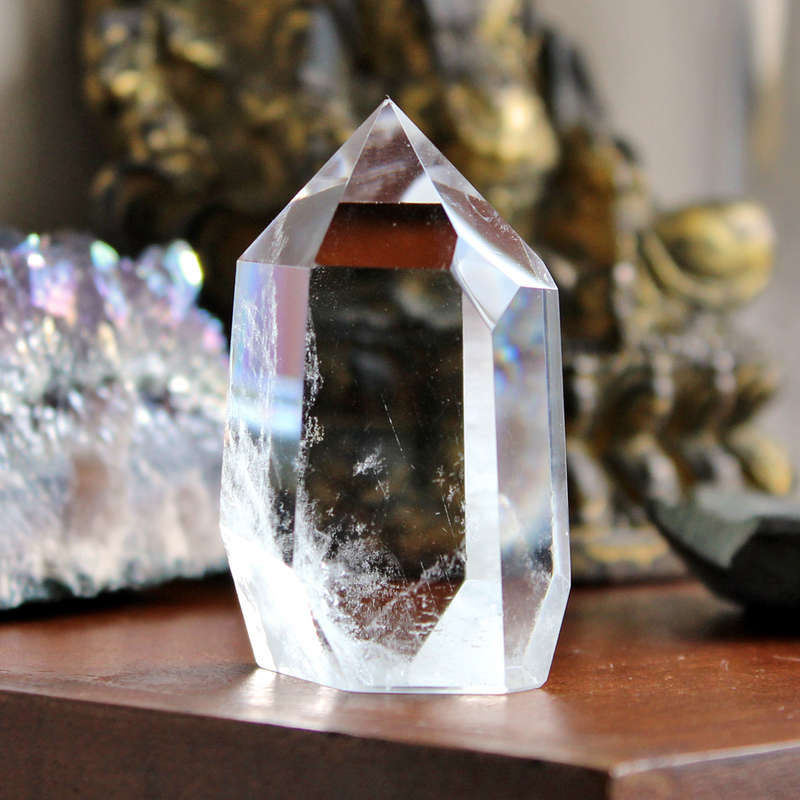 Take your cleansed crystal in both hands and hold it up in front of your Third Eye Chakra (just above eye level). It really is that simple. You can add to this or change it as you wish but that really is all that’s needed. If you’re wondering how to remove a program from a crystal check out my article How to Deprogram a Crystal. Have you had good experiences with programmed crystals? I would love to hear from you in the comments below (Please keep any questions you have on topic if you want a response). If you know anyone who may benefit from this article please share the link with them or use one of the sharing buttons at the end of this post. SO helpful! Thank you for posting! I am a psychic medium and teacher and I am always looking for new insights to help my students! Hallo Ethan! Your article it’s pretty helpful,but i want to ask you, can i program my crystal for more than one property? For example can i program a citrine for abundance and clarity of mind? Good question Marios! I have not tried this myself but thinking about it I can’t see why it would not work. Let me know how it goes. Can i program my crystal for anything ? How do i know which crystal is right for me ? A few weeks ago I bought some crystals, and the last 2 days I have been feeling different. I am a gay man, who suffers with treatment resistant depression, I take my meds, I have been on every one under the sun and every combination, I have suicidal thoughts, life is so dull, I have no energy I haven’t been out of bed in 3 years for the most part. I also suffer with dyslexia, generalized anxiety disorder, and spinal stenosis among other things. Well today I went crazy that I even felt a little better, that I went online and found every crystal for energy and fatigue and depression, and got a amethyst Geode or a cluster alone with a cluster of clear quartz. All in all I spent about 130 dollars.. My faith is against crystals, but I am desperate there is nothing more the doctors can do. So I figured, this is a one time expense, it either works or it doesn’t or maybe it will just help, I have nothing to lose, but some money in my wallet, which I really can’t afford to lose, but my health is so bad, that it is worth it. So I have a few questions first on programming them, can I program them for more than one thing. Like the ones for depression, I want to program to help with depression, anxiety, sleep problems, healing of dispear, and dyslexia as I can’t move forward with all of these mental problems. Will the crystals work on more than one issue. Then I have a set I got for pain, which I am going to program for healing or help with spinal stenosis, arthritis, herniated discs, scoliosis, and pain. The 3rd category I am calling no energy, fatigue, like of life force, for which I want to program for the depression, but more importantly to have energy, and feel alive. I have some stimulants the doctors gave me, but I don’t like them, they only work for a short time, and after a few weeks don’t work at all, and I only feel like I am burning up what little energy reserves I have. So I hope maybe you can shed some light on those topics. My last question how many of these can you carry on you at one time. Is there a limit? Some of the crystals I bought came in a pack of 5, so I am hoping to have some to put under my pillow, and then have some to carry on me at all times, and see what happens in a month. My body is so depleted of energy, and so broken down from years of fighting depression, that I am like ok the more the better at this point. Any thoughts about how to balance this. Michael, how are you getting on? How are you doing? I was wondering if you are seeing a therapist or councelor. I know it has helped me with my depression and anxiety somewhat. My heart goes out to you. My son also suffers from depression and has no energy. I hope you are feeling better. Would it be an idea not to focus on each and every problem/issue, but rather on the result? Imagine how it would feel the day you get rid of all these issues, how it would feel the day you ARE HEALED and have all the energy, joy etc. that you need and long for….and then send THIS ENERGY/FEELING into the crystal – to ask the crystal to help you reach YOUR UTLTIMATE GOAL…not to spesify all the issues….? Whatever you focus on increases! So why not focus on the result you long for, rather than fousing on your problems. you get more of what you focus on, whatever that might be. I now realized that this is an old thread…. I really hope you got the help you needed! Hi, I would like to program my Hermiker diamond so as to be more attune. Can you tell me a way of putting this into a sentence? Hi Carol, how do you mean more attuned? Like intuition/psychic? His Ethan is there a stone to help me attraction love? Actually it works far better if you hold it between your palms focusing your own energy on a single word so that you are fully concentrating on your intention and making your energy flow. Once it grows hot, the crystal has responded to and stored your energy. It will release it with its own in small quantities over time. Does programming work for clusters and geodes too or is it mainly for tumble stones, crystal points and similar? Yes Jennifer, you can program any crystal formation or cut form including Clusters and Geodes! can I program more than one crystal for the same purpose? I am pregnant and I would like to program unakite and pyrite to help me with this difficult situation. Hi Mary other than the healing and money crystals mentioned above in the article you might find some more general healing stones in my article Crystals For Healing, Health & Wellbeing. I do not work with specific health issues as my work focuses on the spiritual and emotional aspects of crystal Healing. So can crystals for certain purposes be programmed to influence something different? Good question. If you mean programming a crystal that is calming to give you more energy then I would not do that. Best to work with the properties of the crystal, unless it is all purpose like Quartz. Hello Ethan, can you program a Crystal for someone close to you to help them and give them the Crystal so they can have it with them? Thank you Ethan for your quick response. Also can it be more then one Crystal programmed for them? Hello Ethan I apologize for asking so many questions. I have a few more sorry, if you program different crystals for different purposes do you have to carry them with you or can you leave them at home would they still work for you or are there specific ones that you must carry with you? I know protection ones you should carry with you. But I mean other ones. My next question is I’ve heard you can program certain crystals for pets. I have a small dog that I adore very much my daughter got him for me. He has been a huge therapy since my daughter left to college 3000 miles away and she’s my only child. But he has terrible separation anxiety my fought he’s so little I take him everywhere and since I was working out of the house it seem ok. Beside the fact that I feel very calm when I have him around. But now I feel bad for how he gets and feels when I try to leave him alone it breaks my heart. If there is a Crystal that can help which one would you recommend and how would I program it for him? Also where would be the best place to put it? For programming, it often depends on the purpose. If you programmed a crystal for personal protection but leave it at home it seems a bit pointless. If someone programs a Citrine for prosperity for their shop, it makes sense to leave it at the shop. 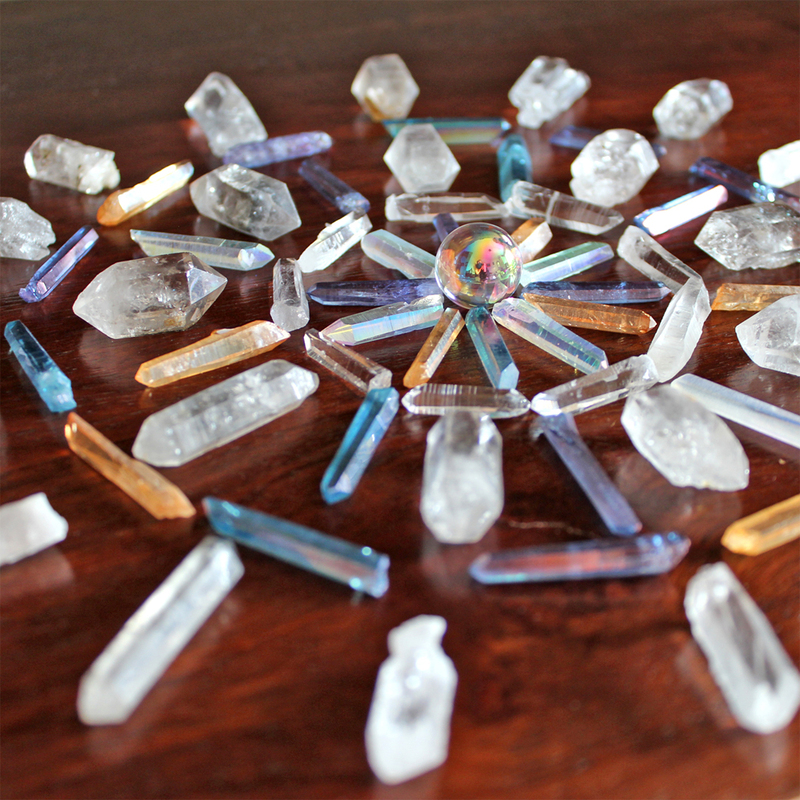 You can manifest things from crystals at home like in a Crystal Grid. Many people like to have crystals around them or to wear that match their goals or help them in daily life. There is no right answer but I don’t think it is a good idea to carry tones of crystals around. I have not used crystals much with animals but you could try a large Rose Quartz (Nothing that they can swallow) near your dogs bed for comfort. About my dog I was told to put an Amethyst under his bed for separation anxiety. All I can say is Wow !!! ALways just test things out that you learn and see how they work for you. I am working on a new article about crystals for sleep and the bedroom area as I get this question a lot. Could anybody help identifying a crystal and what is had been used for. I have tried to get it identified but I am getting different opinions with no definites, very frustrating. when I have programmed crystal do I have to clean it regularly? And if I have to clean it do I have to program it again or does the crystal “remember” earlier programming? Hi, yes all crystals need cleansing from time to time. Your programs are not removed by cleansing them unless you intend to remove them. See my deprogramming article and cleansing articles for more info. 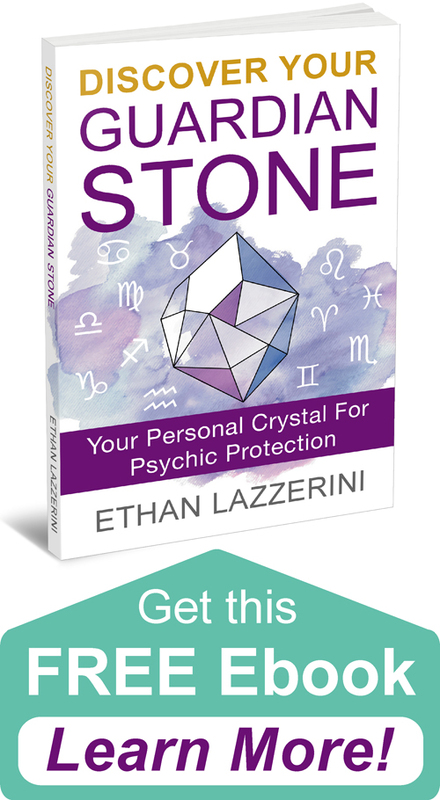 Hi Ethan, this article is super interesting because I will program my crystals for the first time today but I was wondering if I can program a crystal for someone else. I mean, I want to give a crystal to a family member and would like to program it myself to serve my family member. Is that possible ? Hello Ethan! Thank you so much for this article and the few other’s I have been able to read and will continue reading even more of your articles. I am a jeweler, but am new to this aspect of the stones I use. I read somewhere else, that there are stones that can be used together to “super charge” the intentions/outcomes that we are needing and looking for. For instance rose quartz and garnet for love and relationships and citrine and jet for money and abundance. What do you think of this? And if you agree, would I program both the rose quartz and garnet with the exact same intention (I have a specific person in mind) or would one be one thing and the other be another>? The same question for the citrine and jet…I am have been working on getting a business loan for 2 years now to rebuild and expand my business after having to close down to fight and beat cancer. I know I am so close to getting it. Would I program the citrine one way and the jet another or program both the exact same way? Thank you so much for your time and help and any information you could give me!!!! Well more crystals do increase the energy behind the intention but you can have great results from just one carefully chosen crystal too. If your talking about jewellery with several types of stones in it then I would just program the jewellery piece itself once finished for the intention/s. With separate crystals you can do either, it is really up to you. If your carrying them for a specific purpose you can program them for it or program them separately. Thank you so much!! May I ask 1 more question please? I have been reading on what each crystal is best used for, but one place says one thing and another says a different thing. How can one really know what each crystal is meant for? Not that they are that far off, but for some, they really are. And please know, I mean no disrespect to you or am I questioning you at all, I am just trying to find out who to trust and not trust in this journey and want to make sure that I am getting the correct information, not only for myself, but for my customers as well, as I am making and selling my jewelry. Again, thank you for your time and information and direction!!!! 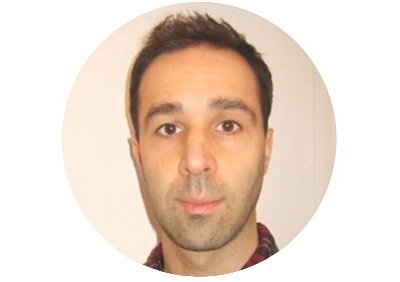 Hi Dana, from now on I am asking everyone if they can keep any questions posted on articles be on topic. I hope you understand. Seemingly conflicting info is something I may cover in a future article at some point. In the mean time look to well respected authors on the subject. Hello sir, i wanna get back my ex boyfriend by crystal healing. Can i get him back by using rose quartz??? My husband and I were having problems. He was just so mean to me that I was constantly a nervous wreck! I programmed a rose quartz to make him love me more and be kind to me. I keep it in the left side of my bra, close to my heart and the results are astounding. He’s now like he used to be and were happy! I also programmed one for a friend who’s life was in ruins. It started working immediately and now a couple weeks later she said she feels like a new person and everything started coming together for her! Wanting to use a single citrine crystal to heal/open my naval chakra and to dissapate negative energy from people around me. Should I program it at all? Should I purchase another and carry 2 separate citrine crystals? What do you recommend? Thanks for the informative website! Very helpful! If you are using a crystal for lots of different things then programming it does not make much sense. If the crystal is dedicated for a purpose or a use then program it for that. Otherwise just use your intention when you need to use it. Great articles. If you use a grid for health and healing do you have to wear the crystals with you too or just leave the grid with the crystals on in the house? Also, the crystal bracelets with several crystals on, so I need t program that for one purpose? or because there are a few of them on the bracelet they l they working against each other ? Thanks! Hi Roxy, wearing the same crystals that are used in a grid is optional and an extra way to support you if you want. Programming is your choice, if you are wearing the jewellery for specific reasons then you can program it for one or more purposes. Otherwise you can leave it and get the general benefits. Hi Ethan, I loved your article and the feedback stories. When I read Michaels post from 2016, i could have written every word. Life is hard. Going to program my crystals and will let you know how it goes. Thank you for the information! I don’t believe so, and it will likely use its other properties to help you towards your desired change. If you want a crystal to be used for multiple things, then there’s no need to program it though. Thanks for the great article and books you wrote. They sound phenomenal. I do love crystals. My Ancient Crystals that comes in the shape of the pyramid are just astonishing. Thanks. Again. Best of luck! I have a few a questions about Shungite crystals. I have read many articles on line but they give a different facts about it. from Russia. I bought a few of them at a crystal store but they were fake. I know it is a lot of questions but I hope you find some time to help me..? I have 4 rose quartz, 1 clear crystal, 1 mala chute, daily I’m programming , keeping crystals in hand , visualising her, and commanding to crystal. Is it right way to attract her. Please guide me. I personally do not teach anyone to use peoples names to attract a specific person in my work. If someones meant to be with you they will be. Hi, I have just responded to you on the article about crystals for abundance. Only you can decide what crystals you need and if you need all of them. You can state the source of the money when you program or keep it general. Sometime being too specific is not good. I personally have never requested money from unexpected sources so I can’t be sure it will work. Hi Ethan, Priya iyer here.. Can you tell me about Law of attraction?? I had read d book called “The Secret”.. I’m trying to manifest things but mind s wavering all d time.. I tried all d techniques but nothing’s working coz my feelings r nt believing it.. I’m trying to do breath up exercise.. My focus s very strong but getting it in present tense s being hard as my inner feelings s nt accepting.. If u know anything can u plz tell.. I think that others that specialise with the law of attraction and positive thinking mindset areas will be the best place to learn more about it. There is lots of information in other books and on youtube now. It takes time to change how we think, I’m still learning myself. I’m carrying crystals bracelets vth me whenever I go out but unfortunately things r turning out to be strange.. Whnevr I carry those crystals I get d opposite reaction than d positiveness.. Any idea why’s it hpng lk tat?? I’ve not heard of that before, but as I’ve said to you elsewhere your mindset and other things you are doing are just as important as the crystals. So it’s only my mindset matters Huh??? Hi, Can I chant mantras keeping crystal bracelets???? Hi Ethan, Which the best crystals we can keep it all time in any needs??? I want to gift someone a few crystals, would it be a good idea to program the crystals for that person? You could do that if you want to but I would make sure that the person receiving the gift knows what they are programmed for.